Sparks, Nevada. December 16, 2013. Sierra Nevada Corporation (SNC) today announced that the company has successfully completed all milestones under NASA’s Commercial Crew Development 2 (CCDev2) phase. 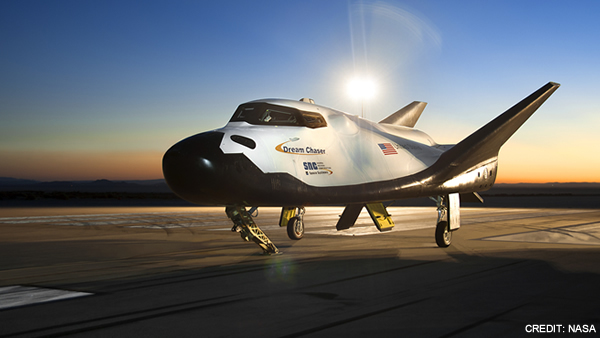 Milestones achieved include a systems requirement review, flight simulator development, creation of a vehicle avionics integration laboratory, system definition review, flight control integration laboratory, preliminary design review and the first free-flight test of the Dream Chaser® spacecraft. The final milestone, free-flight test Milestone 13, was executed Oct. 26, 2013 at Edwards Air Force Base in Edwards, California, in conjunction with NASA’s Dryden Flight Research Center. The objective of the milestone was to lift the Dream Chaser spacecraft via a carrier vehicle to its designated release conditions then release the spacecraft for an unpiloted free-flight test in order to collect trajectory data during flight. All expected trajectory and flight data, including the nominal glide slope and other aerodynamic data, were successfully demonstrated and collected in-flight. The Dream Chaser spacecraft’s performance during flight exceeded predictions and requirements. After extensive post-flight analysis by NASA, SNC received the full award value for the milestone. The free-flight test of the flexible, lifting-body vehicle marked the culmination of years of design and scale model testing completed by SNC and NASA’s Langley Research Center on both the SNC Dream Chaser vehicle and the heritage NASA vehicle, the HL-20. With CCDev2 now complete, SNC is committed to meeting all contracted milestones under its on-going agreement with NASA’s Commercial Crew Program (CCP) during the Commercial Crew Integrated Capability (CCiCap) initiative. SNC is working with CCP as the company develops a next-generation crew transportation vehicle. Dream Chaser is the only reusable, lifting-body human spacecraft with a commercial runway landing capability, anywhere in the world. The Dream Chaser spacecraft is on the forefront of the commercial human spaceflight industry, offering safe, reliable and cost-effective crew and critical cargo transportation to low-Earth orbit.